Results from the 2016 presidential contest between Hillary Clinton and Donald Trump in the Greater Austin Texas metro area. 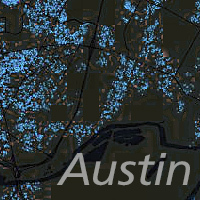 Dot density representation of the referendum on transportation networking companies (ride hailing) held in Austin, Texas in May 2016. 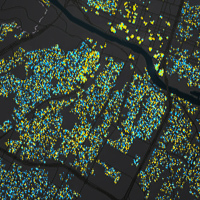 Dot density representation of primary votes for Hillary Clinton and Bernie Sanders in Travis County, Texas. The popularity of the Carl's Jr/Hardee's map spawned requests for a look at the similar phenomenon between the Rally's and Checkers chains. An exploration of the geography behind two different restaurant chains that share the same logo. WaHo density shown as a histogram. U.S. Census Blocks (2010) with reported population of zero. Atlanta has a lot of Waffle House locations. There's a saying that no point in the city of light is more than 500 meters from a Metro stop. A look at the world with country names written in their local languages. Brought to you by Nikolaus M. Freeman's spatial curiosity. Most maps are licensed under Creative Commons Attribution-NonCommercial-ShareAlike. Share and enjoy.